Find the best science attractions for families and the coolest, hands-on science experiences for kids around the United Kingdom. Remember when going to a science museum was a boring class trip to see specimens in glass cases, dioramas of stuffed animals with glass eyes, way too much to read and way too little to do? These days its very different. UK museums and science attractions are work hard to address the native curiosity of today's clued up, techno-savvy kids. The latest crop of science museums are interactive, exciting and full of the kind of inspiration that could turn a child's inquisitiveness into a lifelong interest in what makes us - and our world - tick. Check out some of these. What:This imaginative conversion of a former steelworks in the Sheffield area won a prize from the Royal Institute of Architects for its imaginative reuse of an immense industrial building. Today it is divided in to areas that explore Earth, Wind, Water and Fire with engaging, interactive exhibits, games and activities. It may be science for kids, but it will keep parents equally amazed. And a huge water park and gravity defying play area add to the fun. The Air Pavilion is a "zeppelin" suspended from the ceiling 15 meters up. The Big Melt - recreates the drama of the giant Arc Furnace of the original steel mill. Where: The Templeborough District of Rotherham, near Sheffield. Hours: The center is generally open from 10 a.m. to 4 p.m. and closed on Mondays, but the occasional closings seem pretty random so its best to check their website before you go. Admission: Adult and child priced tickets are available but there are no longer family group tickets. And, astonishingly, this is one of the few UK museums that actually charges for children younger than five. So before you go, check the prices online and make sure your toddler will actually get something out of this experience. What: Serious scientific research sits side by side with science education and science fun in Newcastle-upon-Tyne's Life Science Village. The Life Science Centre features a range of changing exhibitions and activities that bring science to life for kids of all ages. Admission: Everything, including special exhibitions. the 4D motion ride and the planetarium, is included in the price of admission. Family tickets are available and children under 4 go free. What: Initiated by the University of Leicester, which has been involved in space research for about thirty years, this was a Millennium Project for the Leicester City Council. It combines 250 exhibits - 100 of them interactive, with a domed "space theatre" and the UK's largest planetarium in a 42 meter high, landmark space tower. Highlights: Lots of interactive exhibits and simulators. Explore black holes, take a 3D simulator mission to the ice moon Europa, test drive a Martian Rover robot. Hours: Tuesday to Friday 10 a.m. - 4.p.m., Sundays to 5.p.m. Admission: Adult, child and concessions available. Under 5s go free The center is included in Leicestershire's good value Stay Play Explore packages which include an overnight stay and a choice of three attractions for a family of four..
What:Bristol's quirkly named science museum is a science center for children with more than 300 interactive exhibits.If you are confused, that's because it used to be called "@Bristol." Now, in a two clever-for-its-own-good move, the name has been changed to "We the Curious." Don't worry, it's still a great place and a great science playground. Highlights: Watch cosmic rays streak through a cloud chamber, walk through a tornado or get inside a giant soap bubble. The center's small but striking planetarium has shows for over fives and Little Stars shows for younger children. Admission: Adult and family tickets as well as cheaper grandparent family tickets. Planetarium show extra. Children under three go free (under two for the Planetarium shows). What: Who could forget London's Science Museum, one of the UK's top free attractions with both permanent and temporary interactive exhibits in the heart of London's Museum district in South Kensington. Highlights: Stephenson's Rocket locomotive and the Apollo 10 Command Module are among the larger exhibits. Also learn about flight, shipping, telecommunications, computers, medical history, space exploration,geophysics and oceanography and lots more. 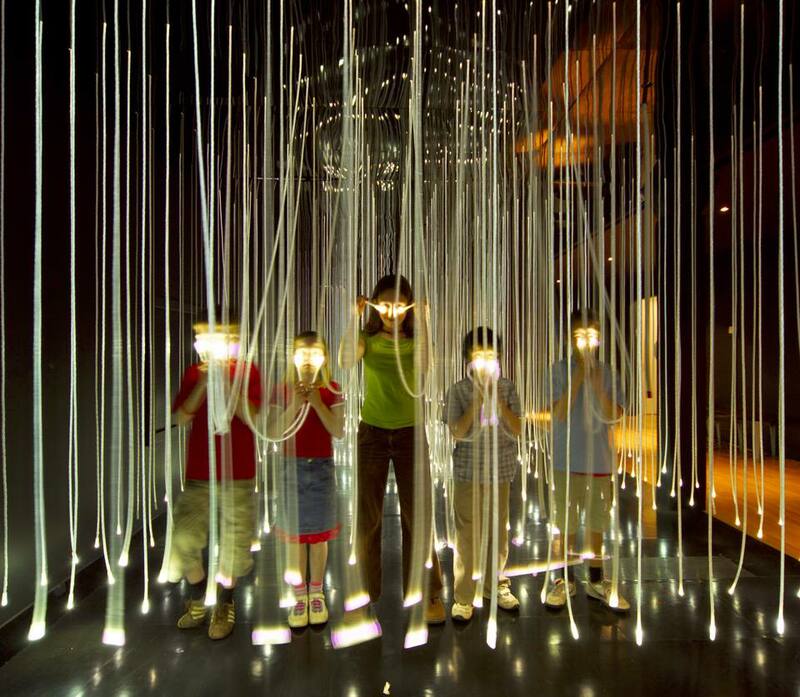 Wonderlab: The Equinor Gallery promises "the most spectacular interactive gallery in the world." So no chance of a bit of exaggeration there then. Hours: 10 a.m. to 6 p.m. every day. There are occasional gallery closures so check the website before you make any promises to the kids. Admission: Free except for flight simulators, IMAX cinema and some special exhibitions. Catch up with current exhibits on video. What: Claiming to be the only "spaceport" in the UK, the Spaceport is a futuristic attraction that combines a little bit of science for kids - about the solar system, the Milky Way, and space travel - with a fair bit of child friendly hokum. Elements meant to simulate a voyage to the space station will thrill only the youngest visitors. Highlights: Star Wars - A private colledtion of Star Wars memorabilia, Space Dome show, Explorer 1 Space Ride. Hours: Tuesday to Friday 10 a.m. to 3 p.m, Weekends to 5 p.m. Admission: Family tickets available as are various combinations with River Explorer Cruise and U-Boat Experience tickets.